After fighting to stay alive for so long, this finally looks like the end for St. Mark's Bookshop. They're having a 50% off everything clearance sale right now, and folks are saying the store might shutter as early as the end of this coming week. Go buy a book. While they last. There's not much left. I've got no more words for this loss. I have loved that store for so many years. On the lighter side...a bookstore that can't spell clearance? I don't consider this the closing of the same store I knew and loved that was originally on St. Marks. This is the long, drawn out spiral from the death of the last location. I'm sorry it's come to this, but the owners are largely responsible for this. Mast books and McNally Jackson are alive and well, even thriving. 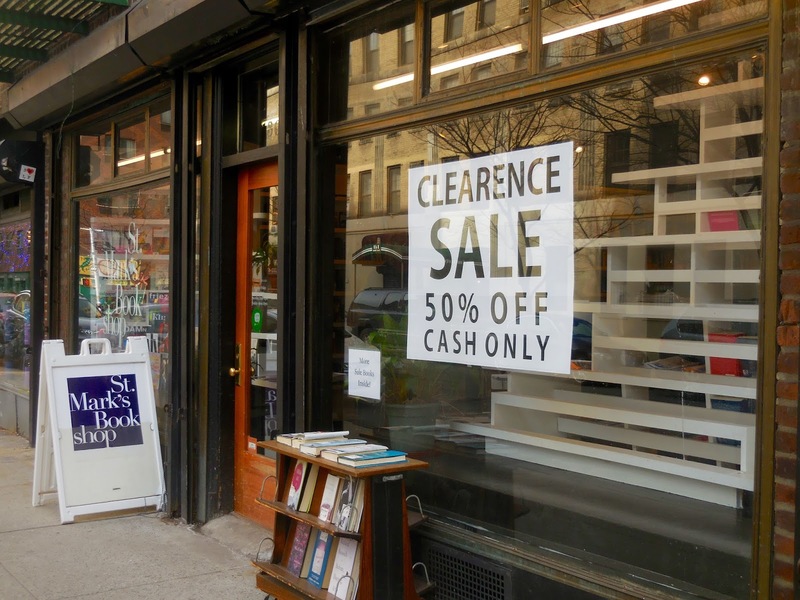 A small bookstore can do well in this city, but the owners of St. Marks didn't make the necessary changes and suffered the inevitable consequences. I wish it hadn't ended like this, because I have many great memories and many great books from the old locations. At one time St. Marks bookshop was a real refuge and link to great ideas and authors. Pre internet that bookshop meant the world to me, but our city and culture have changed and the owners didn't have the wherewithal to adapt to the changes. Fare thee well St. Marks bookshop. Sorry if I may have missed a piece of the story here. I think a little while ago you mentioned something about an anonymous donor stepping in, then today I read this, which apparently fills in some of the murkier details. This is really a strange and tangled tale. 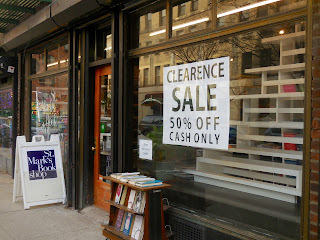 How ironic that the end of the bookstore is marked by a sign with the word "clearance" spelled wrong. So sad. have known the owners for years. read there last summer from my memoir.